Prince Lot Hula Festival Celebrates Hawaii Culture through traditional dance. Discover Hawaiian Hula at Prince Lot Hula Festival! 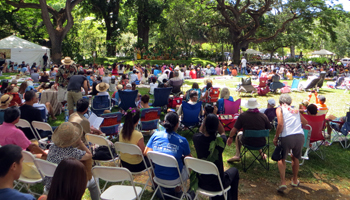 Every July, the Moanalua Gardens Foundation presents the Prince Lot Hula Festival at Moanalua Gardens in Honolulu’s Kamananui Valley (also called Moanalua Valley). This full-day of authentic Hawaiian hula usually features approximately a dozen different halau hula (schools) from Oahu and the neighbor islands – making it the largest non-competitive hula event in Hawaii! You’ll see the ancient style of hula kahiko, which traditionally consists of a Hawaiian language chant, percussive rhythm, and a faster-paced dance involving very deliberate movements. The rhythm is often created by gourds, drums, or even sticks and logs; and sometimes the dances are so energetic that it’s almost like watching elite athletes perform! You’ll also see the modern style of hula auana. This involves slow, flowing movements (and swaying hips) set to a melodic song with a wide variety of instruments and harmonies (sung in any language). This is the style of dance that many visitors think of when they come to Hawaii; and it can be very beautiful. But in my personal opinion, it’s not nearly as fun to watch as the traditional hula kahiko! The differences between these styles are comparable to the contrast between hip-hop and ballroom dancing. What you won’t see at the Prince Lot Hula Festival is a Samoan fire/knife dance, or a Tahitian hula (with the grass skirt, coconut brassiere, and machine gun hips), or a Maori haka. 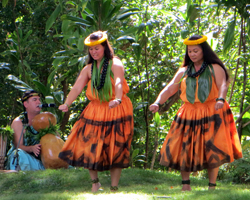 Although those styles of traditional Polynesian dance are also fun to watch, they’re not Hawaiian hula. If you wish, however, you can see most of those dances at a visitor luau or at the Polynesian Cultural Center. 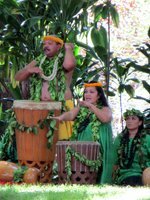 Kamananui Valley was reportedly where hula originated; and it has been a center of Hawaiian hula and chant since ancient times. 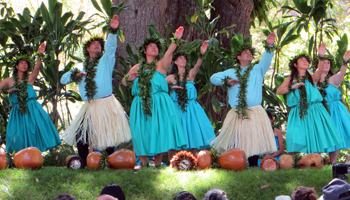 Hula evolved from the need to pass oral tradition from one generation to the next. Before contact with foreign missionaries, the Hawaiian language was spoken word only. 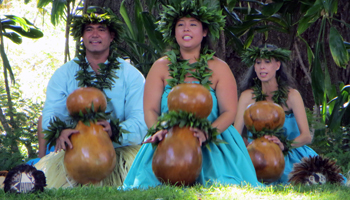 Thus, many traditions were remembered and shared through various mele (chants). 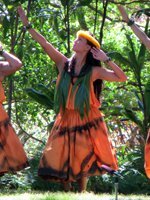 Primary emphasis was given to the words of each mele; and dance was added as a way to illustrate and emphasize the meaning of these words. 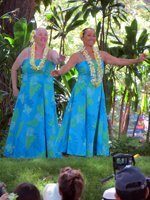 For this reason, before each dance, the kumu hula (teacher) will often share a short summary of the story being recounted in each mele. 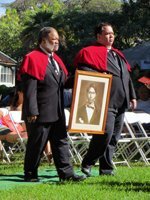 Named for Prince Lot Kapuaiwa, who reigned as King Kamehameha V from 1863 to 1872, this annual event commemorates Prince Lot’s efforts to foster Hawaiian traditions during a period of cultural decline that was largely caused by western influences. In spite of prohibitions against hula in those days, Prince Lot is remembered for hosting parties in Moanalua, where guests were entertained with chants and hula. Moanalua Gardens is located alongside the Moanalua Freeway (H201/78) directly below Tripler Army Medical Center (the giant pink hospital on the hill). There’s lots of parking, but I suggest getting there early anyway because it fills up fast. And they don't appreciate "out-of-the-box" thinking with regards to where you park your car. After only a couple hours, they were making announcements about vehicles in danger of being towed. There are lots of chairs set up for your viewing comfort; and in front of the chairs, there’s a large grassy ground-seating area to lay out blankets and mats. The view is fine from either seating arrangement. I was more concerned with finding a patch of shade that wouldn’t migrate off of me before I was ready to go. Most such shady spots are in the ground seating area. The chairs are largely in the sun, so bring a hat and sunscreen. 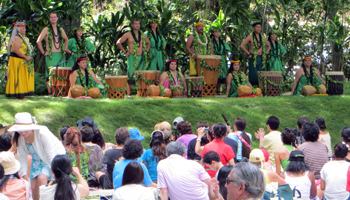 In addition to several hours of world-class Hawaii hula dancing, this Hawaii festival further showcases the traditional island lifestyle through Hawaiian cultural activities such as a Hawaiian glee club performance, an opening procession by the Royal Order of Kamehameha I, authentic art/craft demonstrations, and a hands-on poi pounding activity. Then, of course, there’s also a wide variety of food and craft vendors ready to sell you any snack or souvenir you desire! 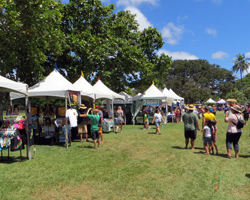 Basically, the Prince Lot Hula Festival is a fun and free way to immerse yourself in the unique beauty of Hawaii’s natural environment and island culture. I probably wouldn’t plan my entire trip around this one event; but if I knew I was going to be here in the second half of July, I wouldn’t miss it! Furthermore, if you’re planning a family vacation in Hawaii, this event is ideal for all ages – even though you’ll occasionally hear a mele about some king’s legendary prowess with his… ahem… “spear”. For more details, click here to visit the official Prince Lot Hula Festival site (opens a new window/tab).